Well over 2,000 participants headed for Soldier Field on Saturday, Sept. 26th for the annual AIDS Run and Walk hosted by AIDS Foundation of Chicago. “Today, we have the technology and the knowledge to end AIDS,” said AIDS Foundation of Chicago President and CEO John Peller, who kicked off the 14th annual AIDS Run and Walk Chicago setting the tone for the race. With the help of runners, volunteers, and staff, the race raised over $377,000 helping 36 HIV/AIDS organizations that provide life-saving services to people living with and exposed to HIV and AIDS. Walkers and runners lined the south lawn of Soldier Field, underneath the sunny sky with signs showing their support to end AIDS. If you are interested in donating, there is still time. Donations are accepted until October 31st. 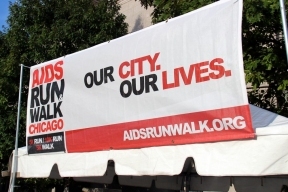 To make a donation or to learn more, visit aidsrunwalk.org or call 312-334-0946.